My pride and my joy. 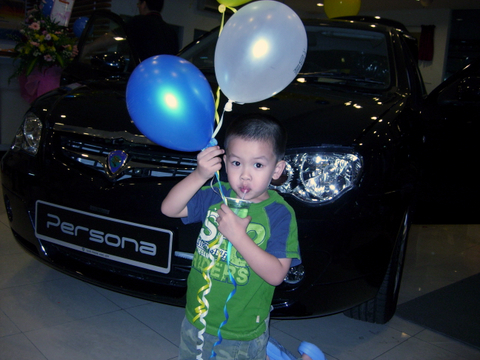 Hehehe, I mean the kid, not the car. 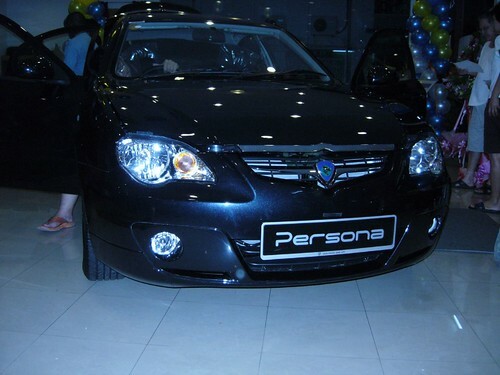 This is the [tag]Proton Persona[/tag]. The backside of the [tag]Persona[/tag]. The dashboard. Hubby said he read somewhere they said it is like a bra. Men. Want a proper review? Go find PaulTan lah. 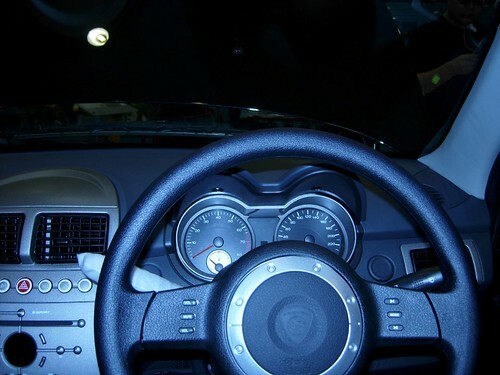 the steering is ugly… to me la. No comment. I gave up on Proton already. Lets put a wager on faulty power windows!!! looks like waja on the head n back. 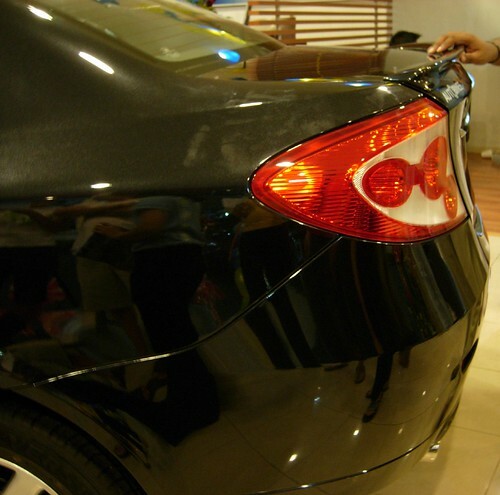 side looks like vios. So poser like. sigh..
looks like waja on the head n back. side looks like vios. It looks like a combination of Waja + Gen2. Or something, I don’t know. Heck. All Proton cars look the same to me. The only difference might be what’s under the hood, price and the name of course. looks like waja + gen2. agrees with terence. 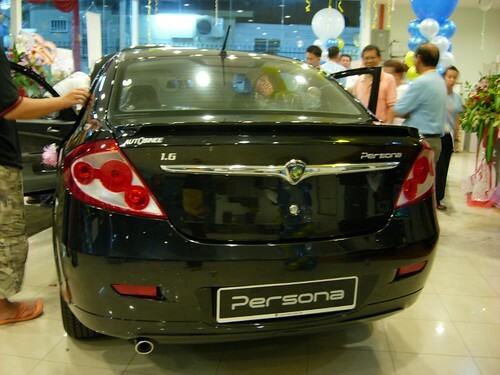 i give up on msian car already..
uhmm isn’t that just a GEN2 with a different name? With the petrol price on the rise, I’m not trading my cheapskate Kancil for anything less than a hybrid car. i think the design quite cantik. The car still the same, only changing the back become longer. Just another feeling — more plastic than metal! memang cunnn abis.. skrg dah pakai dah..memang best gila..macam kete besarleee. I still feel Persona is reasonably priced, style and performance. Some people have their own opinion, anyway cannot please everyone. I have GEN 2 2007.10. I like this car it goes very well, but it can be less plastic. But it ok!! i like it looks …pretty. You guys should see what the aussies did to the Gen 2…very hot! 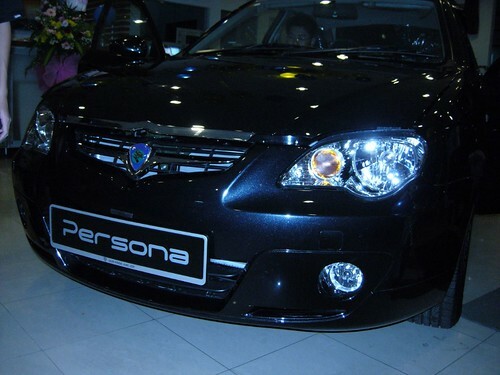 Persona mmg ada umphhh………sapa2 ada persona yang da di modify, send la dgn kita org, mana tau ada idea br nak modify PERSONA sy ni.Tima kacih……..
gua dgr mcm2 la orang campalin about this car..many probrlem. lagi 2months aq akan memiliki n menjaga mu… huhu… terpesona ku pada mu…. mmg byk masalah lah keta xdak kuality, harga mahal…….part semua low quality klu sapa dpt yang problem, masak lah nak maintainnya nanti.